A tricky leg spinner with an action to trouble most batsmen, Mattie McKiernan made his Twenty20 debut for the Club last summer. An all-format player, McKiernan took wickets in both red and white ball forms for the Second XI in 2018, but saw his greatest returns in the game’s shortest form. 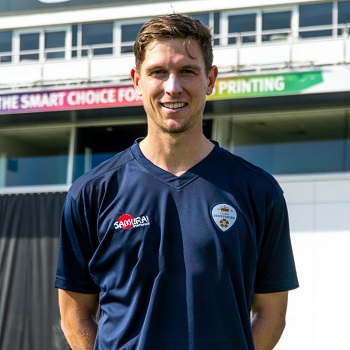 As leg spin, with the ability to skid the ball on or even turn back to the right-hander, continues to be a valuable and sought after commodity in limited overs cricket, the 24-year-old earned a call-up to the first team under Specialist Coach, John Wright. He made one appearance in 2018, and although he was unable to claim a wicket, McKiernan was highly economical in returning four overs for 27 runs. In September 2018, he signed a one-year contract with Derbyshire for the 2019 summer.